Dang this turned out to be a hard race! Highly recommend it though. Here’s the details of the day. 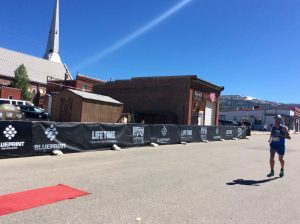 The basics on the Leadville Heavy Half. It starts in Leadville at 10,000ft and climbs to Mosquite Pass at 13,000. It’s an out and back. The heavy part means that it’s 15.5 miles long, soooo just a touch longer than a true half. Amy, Matt Kempton and I drove up from Golden in the morning and it was good times, feeling a bit like taking the team bus to a race in college. Once we were on the start line in the middle of Leadville, we could look way out and up to the east and see the top of Mosquito Pass where we’d be running to. The race was competitive out of the gate, with Tyler McCandless, a 1:03 half/2:16 marathoner, taking it out at a good pace. At 2 miles in, I was with Kempton and decided that if I was going to try to win it then I was going to hard to push it even harder. I raised the pace and matched Tyler’s a bit better. Around mile 3 we went past a bunch of derelict mines on the dirt roads east of Leadville. There must have been some hard work that must have gone into those old mines back in the 1800’s. It’s hard to believe that so many people lived way up there at 10,000 feet way back then. From there the route went from nice smooth jeep road to a rugged and rocky jeep road with a small stream running down the middle of it. A bit over a mile on that, past the end point aid station and into the meat of the climb and up the pass. Looking up towards the top was intimidating, it looked huge and steep! The “road”, I really can’t imagine driving anything but a dirt bike up it, was super rocky with a ton of softball to basketball sized rocks that were shifty underfoot. I ran almost all of it but took a few strategic walks where’s I’d count out 12 steps then get running again. Really just holding a rhythm and maintaining an honest forward movement got me up to the top in pretty good time. Much of it was in a narrow path cut out in the snow and part of the melting snow had frozen overnight creating a bit of ice here and there. 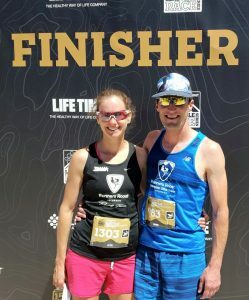 I wore my New Balance road racing flats, the 1400’s, which have a relatively nice grippy tread for a road flat and those were perfect for the race. Coming from the turnaround, Tyler started coming at me when I was near the top and I figured he had 2 minutes on me. I summited, flipped around, and started charging down the technical downhill. This is something I’ve been working on this year after my horrendous descent in my first big trail race at Imogene Pass Run last year. With that extra motivation, I let the legs loose and was really happy with how I was getting down even though it felt like I was always one step away from taking a hard fall. After about 10 minutes of this, suddenly Tyler was in view just ahead and the race was on again! I caught him at the bottom of the technical descent where the aid station is. I passed him and continued pushing it hard on the semi-technical descent. With that, I got about 10 seconds on him going into the last climb of the day, a 1 miler that leads into a smooth and fast 2.5 mile descent to the finish. He sped by me on the climb and my legs were not happy transitioning back to climbing. I gutted it out and he had about 30 seconds on me at the top. From there I rolled the downhill well, hovering barely over 5 minute pace but I just could not get him. That downhill hurt bad trying to run as fast as possible. I was getting dehydrated and my legs were torn up by that point. By the finish Tyler had put more time on me on the descent, finishing 1:03 ahead of me. 2:00:24 for me so over 2 hours of racing and I felt it, was tired! I wanted that win but I was still pumped to get 2nd place overall, especially with it being a Leadville race which I’ve always had respect for. Matt finished up in 3rd place so we had 2 from the Runners Roost MUT team in the top 3 and Kelsey got 3rd in the women’s race getting our team another podium. Amy was happy with her day and she narrowly covered our prerace bet of a one hour time gap to gain household bragging rights on the day.